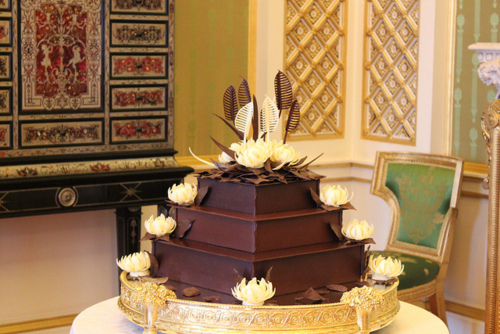 Royals choose chocolate wedding cake. Hi sorry I haven't posted for awhile but I could not resist this story not a recipe I'm afraid but still a interesting story for those foodies that do not all ready know. Well as you all know Prince William married Kate yesterday and became the Duke and Duchess of Cambridgeshire. but did you know that because of Prince Williams affection for rich tea biscuits,Mcvities were asked to produce an alternative wedding cake to the original cake and they did and here it is. McVities crafted the cake at one of its UK plants from a recipe received from Buckingham Palace kitchen chefs.The flawless, square cake rose up three tiers above its golden stand at the afternoon reception. Detailed with white chocolate water lilies, milk chocolate leaves and a mixture of white and milk chocolate feathers, the cake looked fit for the grand occasion. The flowers, which had white Malteser-shaped centres, were placed at the corner of each square and several were arranged aesthetically on top. A smooth, crisp chocolate exterior encased the unbaked delight which was made from dark chocolate for added flavour, crushed rich tea biscuits and some undisclosed secret ingredients. 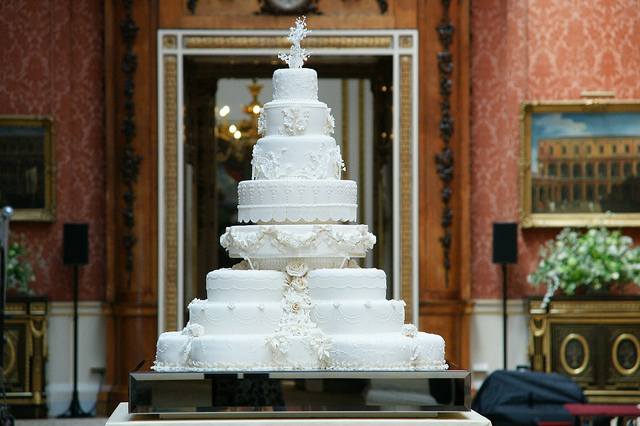 The company, now part of the United Biscuits Group, has made many of the wedding and christening cakes for members of the Royal Family since the marriage of George V to Queen Mary in 1893. The cake required zero minutes in the oven as it is a no-bake cake. 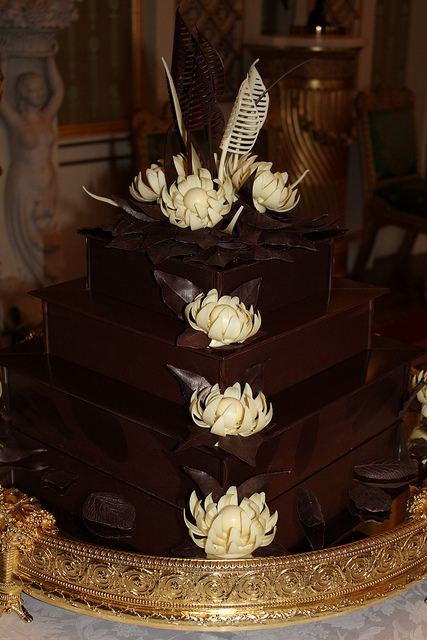 There were 12 white chocolate lotus flowers, or water lilies, to symbolize purity, beauty and spiritual perfection. The lotus is also an ancient symbol of light. The recipe included 1,700 McVities Rich Tea biscuits, and 40 pounds of chocolate. There was also a selection of 10,000 canapés, both savory and sweet, prepared by 21 chefs who were led by Royal Chef Mark Flanagan. The canapés included assortments of Palmiers and Cheese Straws, White Chocolate Ganache Truffle, and Milk Chocolate Praline with Nuts to serve 650 guests at the reception. I am sure you will all agree this is some alternative fit for a King And Queen and from things I have read and that have been reported in the news the cake was more popular with the guests than the official cake. 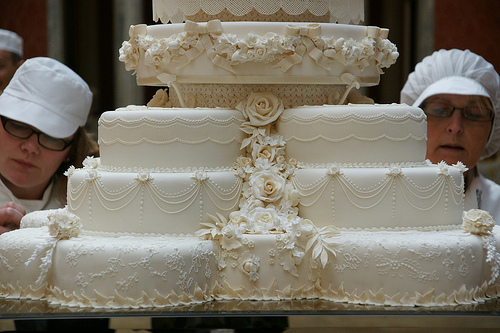 I cannot complete this post by just showing you the chocolate wedding cake. I feel I have to give you the chance to compare the cakes and see which cake you would prefer so here we go. The official wedding cake was made by Fiona Cairns and her team and here it is truly a wonderful work of art and I am sure just as tasty as it looks. There were 17 types of handmade flowers decorating the Fiona Cairns cake. There were 900 individually iced flowers. It was made up of 17 fruit cakes. This is a real work of art and I wish I could craft such a cake but I really don't have those skills. So as you know this blog is mainly a chocolate recipe blog but i really felt I had to pass this info on and i hope you agree it was worth it but what I would like to know is what cake would you choose to have if you could for your wedding or if you had the choice and could only have one piece of cake to eat which one, I already know my choice Chocolate every time. Hi Mac! Wow I didn't know about the cake, and oh my goodness, the cake is crazy!!! So beautiful... 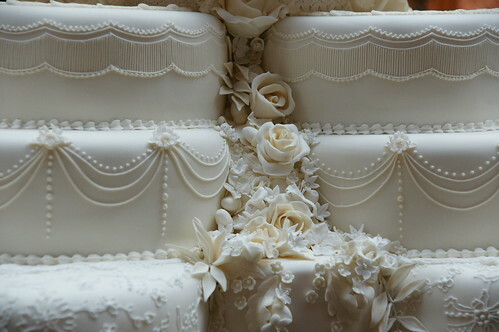 I never seen a cake this gorgeous and detailed! Thanks for posting this otherwise I wouldn't have known! So glad you found this interesting and yes it is really beautiful and very detailed wish I was that skilled. unfortunately not though. OMG talk about decadent..that looks amazing. I am sooo speechless,I want one! I guess you would need a few bucks to be able to afford these cakes, but the Duke and Duchess probably got them free of charge. Once I find out how to delete your comment and protect against spam cheap scrubs you will be gone.